Were you able to get help for your issue? We saw that a user had replied to the question on Reddit which is why we wanted to double check. We would be be happy to help if you still need it. We had no doubt about this information! We wouldn't be here without our community, thank you everybody for your continued support! Bytecoin Roadmap Milestone Achieved! - Meet our High Load Resistance Beta Release! Still I hope for a verry good future for bcn..
Plz, don't hesitate to let us know if you have any questions. Hello! Thank you for sharing this information! Is trading in Bytecoin available on your site? Vote for Bytecoin to add it to CoinEx exchange! And the idea that you do not need to pass KYC, I really like it. Today is our Reddit CakeDay! 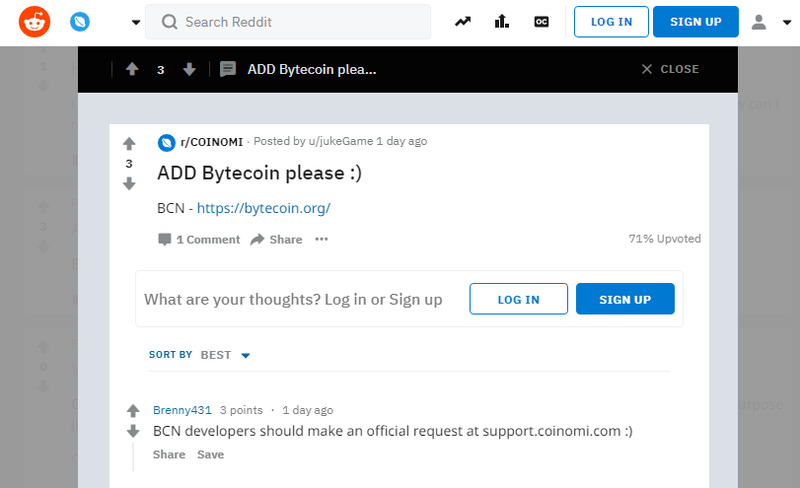 1 year ago today we made our Reddit account to better communicate with the Bytecoin community. Thank you everyone for your continued love and support of the best privacy coin on the market! The Bytecoin Team is not only working on its technical services but also on its customer support features as well! Users can now get helpful service by going to our main website and selecting the new Support button in the bottom right of the screen! We have a BTC/BCN exchange in the Bytecoin webwallet that users are able to use. Have you tried that? Please let us know if you have any questions about it as we would be all too happy to help! You will provide live chat option into this customer support section in future. This is good step to provide support to all users who are using this project. This will give confidence to newcomers to get support on the spot and let understand how to use this. It is not a live chat option but a streamlined interface to get faster and more immediate service. We wish to show our community that we take customer service seriously and that each and every one of our users is important to us. We would love to get listed on the Coinomi service! We will write them and see what we can do to make this happen! What about our community? Do you guys like the Coinomi wallet? I also have bought on HitBTC some coins and still didn't look at wallets to choose one from available. This is actual reason to come here and see someone already have started about coinomi this kind of wallet will be great. Why because you don't need to download whole chain and can benefit immediately of fully synced wallet. I like to have it All-In-One. I'm tired of individual wallets, for each coin separately. Coinomi Wallet is an excellent wallet. I never had a problem. In addition, this wallet is available for iOS and Android, and in this quarter they will release a Desktop version that will work in sync.